Refer a friend and receive £25! * Contact Autograph with the name, address and telephone number of the person that you are referring. Or ask the person you refer to pass on your name, address and telephone number to us. *Please not that the cheque is payable upon the referred client entering into an agreement with Autograph Estate Agents Limited and after the 14 day cancellation period has ended. 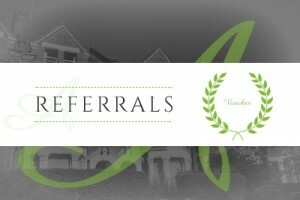 There is no limit for the number of referral vouchers per person.